Published May 29, 2014 By Anna T. This post may contain affiliate links. Regardless, I only recommend sites I've researched and/or used and trust. I am always seeking flexible work at home jobs that are open to many people. Cambly definitely seems to fit that bill. This is a work from home language tutoring opportunity, and you can work anytime and anywhere and you do not need any special skills to sign up and do this. Cambly hires native English speakers to practice English with learners from all around the world. The company was set up by two ex-Google employees who strongly believed that the best way to improve language skills is by spending time chatting with people who are already fluent in the language(s) you want to learn in an informal setting. I found an ad for the tutoring jobs posted on Craigslist last year, but at that time I couldn't find much about them online. Since then, they've been featured in Tech Crunch and if you do a Google search, you'll find a few other articles where they've been mentioned, so the buzz is growing. You can see here that they also have a fairly strong social media presence and it looks like they've mostly responded to the inquiries they receive on Facebook. You do the language tutoring via video, so you'll need a webcam. Basically you are engaging in short chat sessions with Cambly's users. There do not appear to be any hard and fast rules regarding what you talk about. According to the Cambly website, when you're logged in and on your dashboard, it will ring when there is a language student waiting to talk to you. You can decide to grab the session or not, it's up to you. Cambly users will be chatting with you via their mobile devices (Cambly has an app available to download for people who want to learn English) on their computers. Chat sessions can last various lengths of time. Some of the students will stay on for just a few minutes while others might stay on for an hour or more. This can be shift-based or not, but regardless you can work at any time of the day or night. Cambly has a feature where you can sign up for 1-hour priority hours, where they will direct you calls from new students, or you can just log in whenever and take calls missed by the tutors who signed up for priority hours. Cambly pays about .17 cents per minute so if you were taking sessions non-stop for an hour, you'd make about $10.20 an hour. Are you going to make $10.20 an hour? That will depend on how busy you are. There is no guarantee that you will have back-to-back tutoring sessions within an entire hour and of course you never know how long one of your students will decide to stay on. Unless Cambly has changed things since I did my research, you are guaranteed to earn payment for 5 minutes of talk time when you sign up for a 1-hour priority hour even if you didn't get any sessions during the full two hours. My advice would be to look at this as an occasional side hustle. Something you can do to earn money here and there but not necessarily to rely on solely since you won't have any way of knowing how busy you will be. Cambly uses Paypal for making payments. You'll get paid weekly as long as you have accumulated $20 in earnings during each pay period. As mentioned above, you'll need a webcam for your computer. You can buy one for cheap, but if you have a computer that's fairly new, it probably already has one installed. You'll also need a high-speed internet connection. As of the date of this blog post, there are 67 reviews from online workers on Glassdoor. Cambly has a 4.1 rating overall, and most of the reviews are good. Some people do complain that the tutoring platform needs to be updated and that they aren't able to get as much work as they would like. Visit their “Become a Tutor Page” and fill out some very basic information about yourself. Then, you'll be taken to a screen where you need to record a sample video for Cambly to review. In your video, Cambly wants you to showcase your personality, interests, and experience. If you don't like your sample video, you are allowed to record it again as many times as you like until you think you've got it right. Then, submit your video to Cambly for review. Good luck to all who apply! I do have many more online ESL tutoring opportunities listed if you want to check out more companies. Hi, I don’t normally comment to articles like this but after reading some of the previous comments I felt I had to say something. I have been tutoring on Cambly for six months now and have practically stopped my other work because it is so easy. It is true that there may be slow times when you don’t get any calls but in my opinion there is no reason to complain when you’re just sitting at home anyway. In the beginning, I did get loads of those 5 minute calls that seem to be wasting your time. You get those silly kids who giggle and make silly noises, practice their profanity, and a whole bunch of other stuff. I just ignore them. If they want to waste their free five minutes doing that then I don’t have to talk to them. I just sit and ignore them until their five minutes is over. That way, they are less likely to call back and bother someone else. I’m still getting paid. You also get the flashers and perverts but they are few and far between. In my six months on Cambly, I have only seen one flasher and maybe two people that just want to be jerks. I’m not wasting my mind on them. I simply hit the “ban immediately” button, report them and move on. I’m not about to let one jerk stop me from making money. If you want to that is entirely up to you. In my opinion, a buck is a buck. The good thing about Cambly is that after each call, the students are asked to give you a review. When Cambly sees a lot of positive reviews, they will push more calls your way. So, in the beginning you may not get very many calls but eventually they will come and you will have more regulars than you can handle. In a week, I have had as little as $100 and as much as $350 putting in the same amount of time every week. Bottom line, Cambly is a system and when you know how to work it to your advantage everyone gains. Those who just want to make big bucks but want everything to be absolutely perfect should not be looking for Cambly to pay their bills. But it has been my experience that on those slow days when there are not enough calls coming through I have the peace of mind in knowing that their minimum payment for priority hours will bring me some money and I can use those times between calls working on other money making projects. But let’s be honest. No call hours are few and far between. No one is stuck with Cambly forever. It is an extremely flexible program and it is not for everyone. However, if you are unemployed and without an income I say, give it a try. You’ve got absolutely nothing to lose. I can’t speak to those who say that their accounts have been cancelled because of their negative comments but in my experience, it has been more than worth my time to work on Cambly. Oh, I almost forgot, Cambly also offers a $20 referral fee for recommending people to tutor on their site. If you have the connections and the patience you could probably make a little extra cash on the side for making referrals too. Just keep in mind, no system is perfect so it’s all a matter of keeping things in perspective. While I understand the complaints of many people who have commented here – their experiences do not have to be yours. My best advice is to try it for yourself to see if you have the wherewithal to stick with it and turn it into a profitable source of revenue for you. I want to know why the application process is so slow. I received a message from Cambly a couple months ago that they are reviewing my application and I will get a message when that is complete. I haven’t heard anything more, and I don’t understand why it takes them so long to make a review. It seems like it would be rather simple to do. Thanks for signing up as a tutor! Your new account is under review. We’ll e-mail you after your account has been enabled. Same here, it’s been months! Hi guys, like probably most of you here, I’ve tried various methods over the years to earn a bit of extra income by working from home online. Some methods paid (and many did not/were scams), however, usually the effort required was not worth the rewards that could be reaped. About a week ago, I was looking into ways to teach English online and found this website called Cambly that hired English “teachers” (no actual teaching experience required) and paid them to have English conversations with students from across the world that want to improve their English speaking skills. For a job that requires no experience or skills (other than fluent/native English), and with the flexibility to work from online whenever you want, for as long you want, the pay is quite good. Cambly pays its tutors $0.17/minute which translates to $10.20/hour. They pay to your Paypal every Monday and I received my first payment of $152.66 USD into my bank account within 24 hours after pay day. This was just 4 days after starting on the website! Applying took about 15-20 minutes in total. All you need to do is fill in some basic details of yourself and record a very short video of yourself. 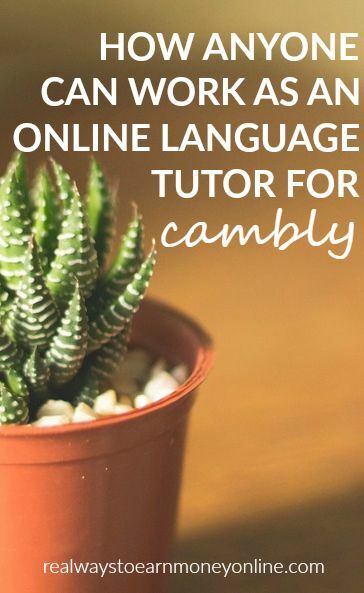 The video is a brief introduction of yourself and why you want to work as a tutor on Cambly (they just want to see you can speak fluent/native English). I was approved within 24 hours and started working straight away. When you first start tutoring on Cambly, all you need to do is go into “available” mode and you will start getting calls from students. Some calls are “general calls” (phone ringtone) – in that there is a student waiting for a tutor (any tutor) and you can choose to pick up the call or not. Some calls are “targeted calls” (piano sound) – this means that the student has looked at your profile and has specifically requested to speak with you. Typically, the latter calls usually result in a more engaging and productive session. Cambly students can sign up for packages which gives them 15, 30, 60 or 120 minutes a day; however, the average session is around 30 minutes. You will, however, get a lot of “free trial students” at the start of your tutoring, who only have 5 minutes to test the service. These students are typically not very serious about learning and/or have very poor English skills. If you get a student that doesn’t participant or that you just cannot understand, Cambly does allow you to terminate the call. Teaching on Cambly becomes easier as you talk with more students. I’ve already got a few regulars that I talk to daily (for about 30-60 minutes each). I find these experiences a lot more rewarding than just taking random calls from the “student pool”. Students that like you can book sessions with you 6-12 hours in advance (make sure you update your reservations availability page for times students can book). Another great feature for new tutors is the Priority Hours feature – which allows you to book “shifts” in advance where you guarantee that you will be online for that hour. In return, Cambly guarantees you 15 minutes of pay ($2.55) even if you get 0 students during that time. Cambly will also promote your profile to students and you will get a lot more targeted calls requesting for you during this time. This is a great way to attract students that actually want to talk with you, with the potential to form long-term tutoring relationships. I would recommend using this feature as much as possible especially early on, so you can start building your dedicated student base as soon as possible. I find the Cambly tutors interface to be quite intuitive and easy to use. It’s very clear and there’s not much clutter. You simply put yourself into available when you’re ready and you’re good to go. During priority hour shifts, you can also take a 5 minute break at any time you like. When chatting with the student, you can see their full history on Cambly – including their total learning time, their background/interests, and most importantly, shared notes from previous tutors who have taught the students. Cambly also has a comprehensive tutors guide which I highly recommend reading in full prior to commencing your first session. They also have a series of “best practice” videos to give you a sense of what a typical session will look like and how to deal with certain scenarios/students. There’s also a section of curated articles (7-10) posted weekly on their blog which you can use as material for your lessons. But don’t worry too much about all that, 95% of the students on here just want to practice their English conversation skills. I’ve taught students from literally all across the globe. I haven’t had any rude or “bad” students and they are almost all very friendly and eager to learn. Almost all subscribed (paying) students are serious about learning and will listen to your advice. The only students who are not engaged or serious are the free trial students. However, as mentioned, you can disconnect the call or even report them if they are not actively participating in the lesson. I usually quickly end the calls/report students who are not willing to participate, have technical difficulties or simply are not understandable…so I can quickly move onto the next student who is serious about learning and might become a long-term student. Hey, Steven, thanks for the very detailed review. I am a Cambly tutor but have not worked yet. Could you tell me the best time to take calls? Thanks. My two cents about Cambly. I worked for them for around 7 months, I was reasonably happy as I enjoyed staying at home to work. What I wasn’t happy with was the constant dropouts and system gremlins that seem to always be there. Cambly will always blame you, and don’t even think about using live support, nobody replies. The final straw for me was when I was told that tutors must know when to update their systems, Cambly put a plugin on their dashboard but gave no instructions. I queried why they would put a plugin on the page and not inform the tutors you needed to upgrade to Windows 10 to be able to use it,two days later the exact information I had spoken about was placed online. The other point would be that you are dealing with some very sensitive Americans, it seems any little thing can upset them. Dorothy,who seems to be the manager, is a very PC, sensitive kind of gal. She does have her good points, but she will cancel your account if any harsh words are directed towards her overly sensitive staff. Overall it’s an easy buck, but it does become frustrating when their system keeps failing. Cambly has been insanely busy lately. I pretty much never go more than 30 seconds without a chat request. Almost students all are from Saudi Arabia, so I wonder if they’ve upped their marketing there. Be careful on Cambly site. I am a 33 yr old woman. Too many men acting rude or flashing on video camera. Good part there is immediately ban on male flashers. It is annoying when people are laughing then hangup. They sign up with another account doing the same rude stuff. By the minute isn’t worth it.Its too much where I ust do 1 hour shifts and nothing else. I had to so other nest jobs with lame Humanatic, turks, and trying USA Contact. I had to sell my junk online. It is sad rude people and flashers ruin it. The only positive is weekly pay. It is why I do 1 hour shifts instead of signing up for more shifts. Sign up shifts does guarantee you somewhat of a pay if its slow. I sometimes just signed on without shifts is easy. Less students on using it now, when I signed back on. There are some good students that want to learn I wish Cambly provide better teaching materials to tutors. Cambly has a support group on Facebook. CAMBLY IS THE WORST. I have read several reviews about Cambly being awful with their customer service, I applied several times to be a tutor, and for weeks/months my account has been “under review” whereas my sister applied also and was accepted within 3 days. I have tried contacting them to find out if this is just their way of rejecting an account. i am certified to teach English as a foreign language and have teaching experience (whereas my sister has zero experience and did it for fun). I am not sure why I wouldn’t be accepted. Aside from that, my inquiries to their “customer service” have been met with a rude, inconsiderate response. I would have been fine with the rejection had they not been so rude about it. Furthermore, my friend spends hours a day on Cambly and is lucky to make 20 bucks. Thanks, just updated the info. As long as its over $20, payment is sent weekly. Thanks for the review, but unfortunately im not a native speaker i mean i speak fluently but its not my native language, however i speak Arabic and Romanian as well. im wondering if i can apply as a tutor ? Cambly do take speakers who speak Arabic. Half of the callers are Arabic trying to learn English. Some callers may want Arabic. Other languages are a benefit. Thanks for the review, Anna. I’ve been doing some conversational English tutoring on a different platform recently and really enjoying it. I figure it’s probably a good idea to be registered on a few sites like this. It seems like it can take a little time to build up a reputation and a good list of regular students. Before that happens, I can bounce between a few of these different sites and hopefully increase my odds of success. What other sites are you using to do tutoring? I love Cambly. They pay immediately on paypal. There are times I almost made up $10.20 an hour. It depends. Be careful of students who might flirt or be rude. Just stay positive. Its easy to do. Its a regular conversation. I was about to sign up, I mean I did sign up but stopped when prompted to video record myself. I basically grew into adulthood at the same time as the internet developed (I started using it in college). I remember its infancy and am fully aware of how it has developed. I don’t take putting my face out there lightly, much less putting a video of myself. Call me paranoid, but considering how radically the internet has developed since 1992, I am concerned: what will happen to my internet images and recordings of me in 20 years? Millenials should beware. Here is Cambly’s legal document, the User Agreement, think twice… they can basically LEGALLY do ANYTHING they want with their videos of YOU. The video it just to make sure that you are able to communicate on the fly in a conversational type way. However, I understand your concern. It took me awhile to agree to the video as well. It has been a great experience for me. I wish the pay was more. This sounds interesting! How are you tutoring? Do you just converse? I’m unclear how to teach with the language barrier. Also, is there a link of a review of the tutoring site? Yeah, you just talk! Most people are already conversational in English, and if there is difficulty holding a conversation, you can always ask them to practice a bit more before rejoining. Actually, Sean, I applied just around New Years, it did took a few days without response, but as Christian said, if you email them it usually takes a day or two for them to respond and they will notify you about your application. I, personally am not a native English speaker and I got in without any issues. I applied for this a month ago sent in my info and even have my profile page setup on there and it says under review. Then I found out they are not hiring us tutors right now. Very frustrating. It looked like a good egg to have. Thank you for all of your great resources. I regularly visit realwaystoearnmoneyonline.com and wahadvetures.com to keep abreast of opportunities. I am an Amercican in my 30’s but I decided to travel and am out of the country. I do keep multiple “eggs” in my basket but I wanted to comment that Cambly is turning out to be a nice find. When I saw the posting on both sites I decided to check them out. I am on my third day as a tutor and have earned over $50 already. My experiance at first was the same as yours, but just before last shift ended on my first day I got a great student. I worked with her for a little bit over an hour that night and she will be studying with me 6 days a week for the next while. I have shifts scheduled 4-8hrs a day six days a week and with the one student only will bring in $200+ next week. Add to the foregoing the fact I enjoy speaking with people and learning from them about their culture, and Cambly is a great find. The income might not be much in the US but many places around the world micro task pay is considered a high salary. I think also with time I will be able to build up and maintain 4-5 students which would then provide a great wage/time balance to enjoy exploring the world. I also wanted to mention that I have been working on micro tasks with a second laptop while waiting for students during my shifts but did not include that income in my previous earnings quotes. Thank you for creating such a valuable resource. Your reviews and listings of companies have allowed me a freedom that I previously never knew existed. Wow, that is awesome! I’m glad you’re doing so well with it, and thanks for the kind words! What you mean when you say that you are earning income from micro tasks? Can you provide any links? Micro tasks are generally only extra cash, but you can make an easy $200+/month. They are short tasks that take anywhere from a few seconds to a few minutes or maybe a couple of hours. Most commonly they are available through crowd sourcing companies such as MTurk, Scribie, ClickNWork. This work usually pays same day or within a couple days, so if you need a small amount of quick cash they are great. I use them as a supplemental income. For me that extra little bit they provide is the difference between living paycheck to paycheck, and having money left over at the end of every month. Anna actually has a lot of great links and information on this site. She has reviewed most of the current sites. You might try a few of the sites until you find a couple that are comfortable for you. Freelance work is also great and you might check out the information our Guru has on that. It’s working well for me earthichick. A day or two after I applied I sent an email to the company. They responded back with an approval. You might try this trick as I here they are getting a lot of applications. It is my second week and I already have 3 students scheduled 5-6 days a week. I find that I am talking to many more students now during my shifts and loving it. For those of us living abroad online ESL tutoring is a great option. Don’t hesitate to ask if you have any other questions. I don’t want to spam Anna’s site with my blog (I haven’t monetized it yet anyway 🙂 ), but if you click my picture you can get hold of me there. As a quick update I wanted to let people know that the first has come and gone with Cambly making their payment to me as promised. If you’re a “talker” like me, check out Cambly and the other education work reviews Anna has. You can turn part-time work into a full-time salary. Hi Christian! Would you know if Cambly is also hiring non-native English speaking teachers? Thanks. Looks like it may be jobs (at) cambly (dot) com. Thank you for this post. Is this open worldwide? TY for the link! Great article! Also, try this one: just learned of it today!